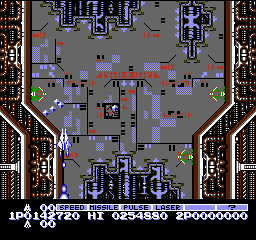 Romhacking.net - Review - Great Arcade Conversion! 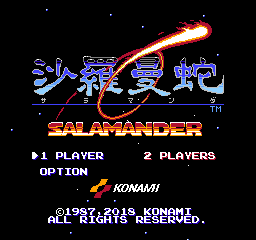 Here is a hack for Salamander which gives it a little bit of the arcade look to this NES version. Palettes are changed on all the stages to match the arcade version and the options are re-sized to what they originally were. 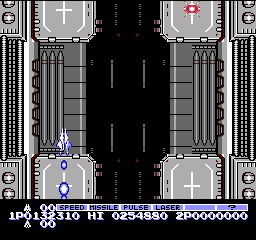 Also the ship looks more like its arcade counter part. An option menu has been added where you can adjust lives, continues, game difficulty, and run a sound test. 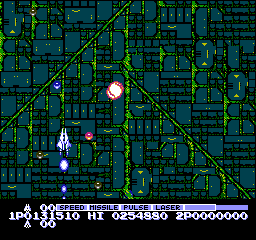 The mapper also has been upgraded to an MMC5 one. A very well done conversion that closely mimics the arcade game. 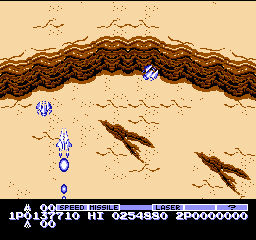 Faster action and more challenging than the original NES version. Options menu a welcome addition. Only thing I’d change are the color pallets on the final stage, they are a bit hard on the eyes.